I've had a huge craving for anything chocolate and marshmallow this pregnancy. I've eaten plenty of s'mores made in the microwave. 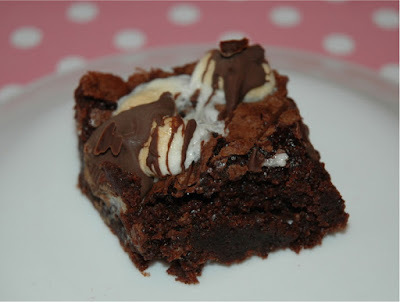 Last night I whipped up some of these easy brownies and they hit the spot. Yum! 1. Make brownie mix according to package directions. 2. Take brownies out of the oven a few minutes before they are done. Sprinkle mini marshmallows over the top of the brownies. Bake for the remaining time (until brownies are done and marshmallows are golden brown). 3. Melt chocolate chips in microwave. Stir. Drizzle over top of brownies.